Another big turn-out in Newcastle would see six more players through to our National Final in Nottingham and we’d also be finding a new North East champion as the soon to be dethroned Stephen Flynn was absent. Last season’s Team Event winners, the Royal Tavern, were looking for back to back wins but their challenge didn’t last long as their representative Stevie Fairbairn was the first player to be eliminated. 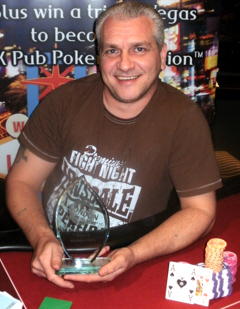 Other players who exited early were Michael Jopson and previous North East champion, Kevin Ginger. 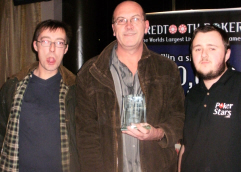 The outstanding venue was the Burn Inn in Co. Durham as all three players flirted with making the final table. League champion Richard Clinton was accompanied by Matthew McLean and Scott O’Brien. David Gray‘s very large chip stack put him as the big favourite as the majority of our short stacks hit the rail one by one. However, one of our finalists had home advantage on his side as Rob Flett creeped into the heads-up match against John Mann after David Gray left in 3rd place. The final hand had Rob in good shape with his A-J up against john’s 7-3. A 2-Q-4-2-4 brought no help to either player as Rob Flett became the new North East regional champion! Rob leaves with £500, a crystal glass trophy and a seat in next year’s national final. Well played!